On April 20, 1999, it seemed as if the entire country stopped to watch the deadly incident at Columbine High School in Littleton, Colorado unfold live on national television. With the SWAT team and policemen everywhere, it seemed for a moment, as if we were watching a made for TV movie.....but only for a moment. As witnesses came forward to tell what they saw inside of that school, it didn't take long to realize that this was for real. It was anything but a movie. Columbine Hugh School had just become the stage for what would eventually be known as one of the worst high school shootings in our nations history. What happened that day would not only change the town of Littleton forever, but it would also change the rest of the country, and probably even the rest of the world. On that tragic day, more then 20 kids were injured, while 12 other kids and one teacher lost their lives. In my eyes they are all heroes: some gave up their lives for God while the others gave up their lives to save their fellow students and teachers. I believe that on that day, Jesus wept as he saw the crime being committed, but I also believe that on that day, our loss was Heaven's gain. God took them all to spend eternity with Him in Heaven. 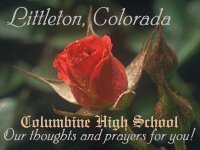 It is my prayer that we will never forget the victims at Columbine High School. We must always keep their memories in our hearts and their loved ones in our prayers. Please, do not allow this to be another incident in which you mourn for a little while and then as you get on with your lives, you forget and look at this as "just another shooting." While we must keep the survivors in prayer as well, I have created this memorial page to remember those who lost their lives. They may have been taken away from us, but their memory lives on. This memorial consists of bios of each victim, as well as the last poem written by Cassie Bernall, lyrics to "Friend of Mine," important addresses, a webring that I hope others will join, and a couple of memorial pictures. Please take one, or both, and put them onto your site. Let us not forget Columbine High School. Steven Curnow, 14, dreamed of being a Navy top gun and piloting an F-16. He had seen the Star Wars movies so often he could recite dialogue from the films. Curnow played soccer as a boy and later worked as a referee to earn pocket money. Corey DePooter, 17, was a good student who loved to golf, hunt and fish. A former wrestler, he recently took a maintenance job at a golf club to save up for a fishing boat with a friend. DePooter hid under a library table with friends as the gunmen sprayed bullets at floor level. Kelly Fleming, 16, was an aspiring songwriter and author who wrote scores of poems and short stories based on her life experiences. She was learning to play the guitar. Fleming moved from Phoenix 18 months ago and was eager to get her drivers license and a part-time job. She was shot in the library. Matthew Ketcher, 16, was a junior who had hoped to start for the football team. Ketcher lifted weights and played on offensive and defensive lines. He maintained an A average in school. Ketcher was shot in the library after he tried to reach friends hiding in an adjacent video room. Daniel Mauser, 15, was a sophomore who excelled in math and science, and earned straight As on his last report card. Mauser ran cross country and joined the debate team. He liked to ski, camp and recently returned from a two-week trip to Paris with the French club. Mauser was hoping to get his drivers license next year. William Dave Sanders, 47, was a computer and business teacher for 24 years. Sanders coached girls basketball and softball; his basketball team posted a winning record in his first year, 1997-98, after finishing next-to-last the year before. He was married with two daughters and five grandchildren. Sanders was shot twice in the chest in a burst of gunfire while leading two-dozen students down a hallway to safety. He survived at least three hours, until students were rescued. Students said as Sanders lay dying, he asked them to please tell his children that he loved them. Rachel Scott, 17, played the lead in a student-written school play, Smoke in the Room. Active in the Celebration Christian Fellowship church, she also liked photography and was hoping to work as a missionary in Africa. Scott earned good grades while working at a Subway sandwich shop to pay off the car she had borrowed from her parents. During the shooting rampage, her younger brother Craig, 16, played dead in the library and helped lead others to safety. Isaiah Shoels, 18, was due to graduate in May. He suffered health problems as a child and had heart surgery twice. Shoels wanted to attend an arts college and become a music executive. He was small in stature, but played football, wrestled and could bench-press twice his weight. Shoels transferred from Lakewood High School. He was shot in the head execution-style in the school library specifically because of his race and athletic interests, witnesses said. John Tomlin, 16, enjoyed driving off-road in his Chevy pickup. He worked after school in a gardening store and belonged to a church youth group. Last year, Tomlin went on a missionary trip to Mexico with his family and helped build a house for low-income people. He planned to enlist in the Army in two years. Lauren Townsend, 18, was captain of the girls varsity basketball team, which was coached by her mother. Fellow players said she was consumed by the sport. Townsend, who had a 4.0 grade point average, was a member of the National Honor Society, a candidate for class valedictorian, and wanted to major in biology in college. She volunteered in a local soup kitchen and also worked after school in a veterinary hospital. Townsend attended the school prom last week and had received a scholarship to attend college in Colorado next fall. Kyle Velasquez, 16, A special needs student, neighbors say Kyle touched everyone he met. Friends describe him as a big, happy boy, a gentle giant who always wore a smile. A military honor guard attended his funeral because Kyle had a special interest in the military and showed great respect for men and women in uniform. Friend of Mine Buy the CD, written and sung by two Columbine students. Proceeds go to victim's families. Columbine, flower bloom, tenderly I sing to you. Columbine, roseblood red, heartbreak overflow my head. Columbine there's hope for you. To your gain, on the mark. With your love, love again. Comfort peace and sweet release come from you. Where, it's true, I hide myself in you. Can you still hear raging guns ending dreams of precious ones. In God' son, hope will come, his red stain will take our pain. Peace will come to you in time. Turn a page, to your gain. Keep your heart on the mark. Christ of grace attend this place we look to you. Fix you in our view. Tenderly I sing to you. Columbine, roseblood red, heartbreak overflows my head. This poem, the last one written by Cassie Bernall, I have named "Cassie's Stand."